This morning, our beautiful daughter, wife and mother lost her struggle with bowel cancer. Wendy asked me to write a piece for you all when this time came, and I will. There is so much I want to say, but I will need a little time. For now, please forgive the short update and grant us some time to come to terms with our loss. I am so very sorry to learn of Wendy’s death. She was such a lively, fun person to know and to be with. I shall miss her very much, and my heartfelt best wishes go to Steve and all the rest of her family, her many friends and acquaintances. I’m so sorry to hear this. I will remember Wendy as someone with time for everyone and so determined. My condolences to Steve and the family. Thinking of you all at this very sad time. I can’t believe it. If ther is anything I can do please don’t hesitate to ask. Wendy was one very special person and will be greatly missed. Steve, Richard Rebecca and judy I am so sorry to hear of your loss. It was a privilege to have known Wendy with her humour and wit, her compassion and thoughtfulness as well as her steely determination and grit. I’m so glad I met the man who tried to tame this wonderful, full of life person, Wendy was responisble/involved for some of my fondest memories as a teenager and I will never forget her. My best wishes to you, your children and her mother Judy who has been been dealt more bad blows in life than I for one could take. And finally I got around to getting the calander from BHS Merry Hill yesterday evening, so glad you managed to bring that to fruition before her passing. So sorry to hear this devastating news. Thoughts with all of your family at this sad time. So sorry to hear this devastating news. Thoughts with all of your family at this sad time.. If you need anything, anything at all just shout. Steve, my thoughts are with you and the family on this very sad day. Wendy’s journey has been truly inspiration in the face of such darkness. We feel privileged to have had her touch our lives. May all our memories of Wendy shine bright for ever more. God bless, Guy and Family. I’m so so sorry to hear this awful news. Bless her, for her brave fight, for her daily blog, her brilliant sense of humour. .and for ALWAYS ALWAYS thinking of others as she was going through so much herself. She will be missed by so many. Sending warmth and love to you all, her Mr Wonderful, her children & her mum. Steve, mom, Richard & Rebecca each of you were specially chosen by God to be in Wendy’s life. Richard & Rebecca, in time my lovelies, do what your mom set out & nurtured you to do. To Live, love & enjoy your lives , that will give her all the pleasure & happiness she needs from the heavens above. We are so very sad that Wendy has lost her fight, she is now free from pain & suffering. She will live on in our memories, she was some girl! Thinking of you all at this very sad time. Wendy was the most inspirational person I have ever met. I feel so blessed to have been one of her many many friends. She had so many because she really cared about people if something was wrong and she could help she would even when she was suffering so much. She wanted to raise awareness about bowel cancer well she certainly did that I’m sure most of us didn’t know much if anything about it before her blog. So Wendy achieved this. She wanted to raise money for beating bowel cancer she achieved this. She told me once she didn’t think she was inspirational, amazing, strong, brave but as we all know she was wrong on this she was all of these and more. I for one as I’m sure many more will carry on her good work making people aware and carry on fund raising. I’m also sending everyone a hug who needs it on such a sad day. I am so very very sorry and sad to read this. Whilst we have spoken a few times on the phone and via the Beating Bowel Cancer website, I never met Wendy, and I wish I had. She had strength, grit, determination and a huge desire to help others with this sickening disease. Her efforts will not go in vain. 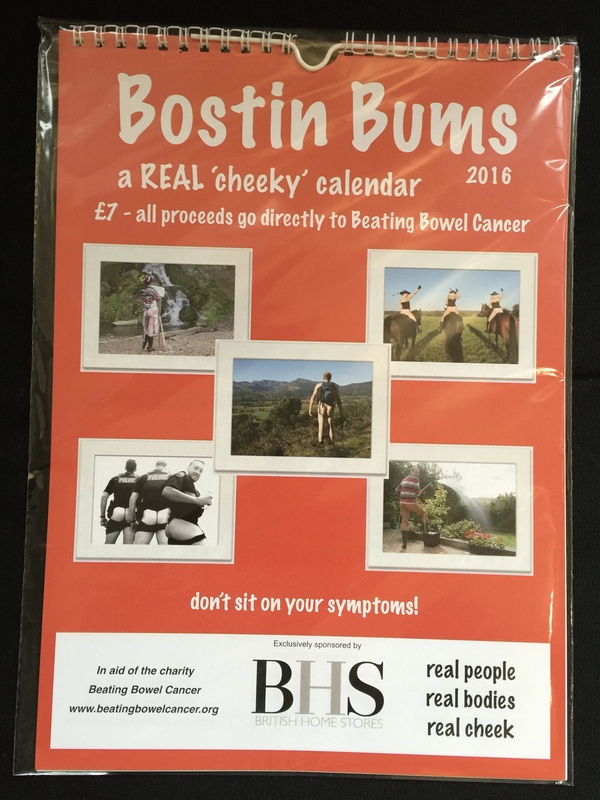 Always supported by her fab family, they have all done something so wonderful by producing the calendars, and all of you who helped make this dream come true have also helped the BBC charity. This charity helped me when my mother and I were both diagnosed with bowel cancer within a month of each other. I subsequently became a volunteer moderator on the forum boards which is how I met up with Wendy. I have purposefully not been in touch with Wendy due to her health recently and whilst I knew she was very sick, I don’t think I grasped the severity of it all – to say I am ‘gutted’ at this news would be a huge understatement. I just want to add one thing. BHS I cannot tell you how much respect I now have for you as a business. Kudos. You know how to look after your own & how to help whenever & wherever you can. My love, thoughts and prayers to all of Wendy’s family and friends. So very sad to hear this news, my heart truly goes out to each and every one of you Steve. Wendy was an amazing lady and will never be forgotten. Sue met with Wendy at the conference and with Mr Wonderful,who also visited her store on the Island,she told me what lovely people they both were,but I think I already knew this,the warmth and honesty and deep family love that shone through in Wendy’s blog told me this. What a lady,strong courageous and full of fun. My heart felt condolences go out to her wonderful family and friends. I’m not a religious person and I have no real thoughts on what happens in the afterlife,but I know with a soul as strong and loving as Wendy’s,That she will live forever. Previous Previous post: Finally at home! Next Next post: Where to begin?